Recently, in one of my Facebook groups, somebody asked me how I get so much done, and it really made me pause. Because, the thing is, I don’t really feel like I get that much done. OK, some days are better than others! But I’ve often thought of myself as being at a disadvantage in the business world because I only work part time — about 20 hours a week. Turns out, that’s actually one of my biggest advantages! Because I’m pretty good about buckling down and doing the work in the few hours I have available, and then building slack into the rest of my day for when things go off the rails. 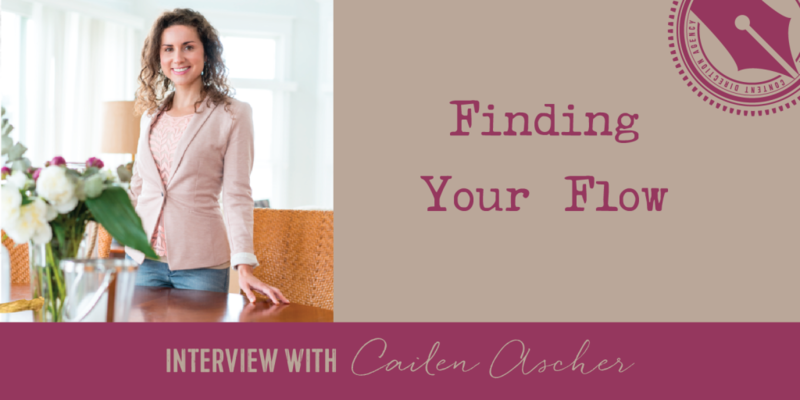 In late 2016, I had the incredible pleasure of interviewing Cailen Ascher, a mindset and clarity coach who specializes in helping people find success on their terms — including three day work weeks! Intrigued? Click below to listen in to our conversation! Cailen talks a lot about finding your flow — and flow is one of my words for 2017 — and gives some examples of how to create flow in your business. We also talk about the importance of mindset and how your mindset is your vehicle to get where you want to go — whether it’s a supped up sports car or a beaten down VW bus (like me). She also dives into the fact that trying many different tactics may not work if your mindset — and therefore your strategy — aren’t in place. A lot of people find this mindset shift and flow in the balance between a fulfilling life and a successful business. Ask yourself, “is the juice worth the squeeze?” Is what you’re getting out of it equal to what you’re putting into it? Want to grab Cailen’s guide to building your own three-day work week? Click here to download it now.